agents to grow their business with social media advertising. Don’t worry. We’ve made it really easy! 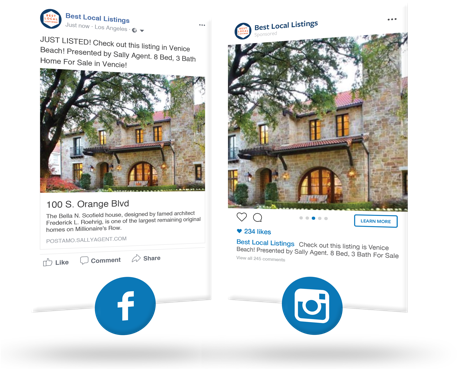 Choose a new listing to promote and reach new people on Facebook and Instagram. Postamo automatically generates your ad. You can customize it with a few easy edits and it is ready to share for 7 days on Facebook and Instagram. Your ad will get more views to your listings and build your personal brand. We will generate a shareable report with your custom results when your ad finishes. You can track progress on your dashboard and our customer support team is always available. Great! Its 100% free to sign up and no credit card is required.